The Covington-Porterdale county subdivision had a population of 33,250 in 1990. The County seat of Newton County, North Central Georgia, 35 miles East South East of Atlanta, West of Madison, North of Jackson Lake and South West of Athens on U.S. Route 20. It had orginally been incorporated as a town in 1822, as a city in 1854 and as a County Seat in 1882. Once part of the Creek Indian Nation, Covington was founded in 1822 and named in honor of General Leonard Covington, an American Revolutionary soldier. Like most Georgia communities, cotton was 'king' and the development of the cotton mill brought the first real signs of prosperity to the area. Covington played an active role in the Civil War when on the evening of July 20, 1864, Union forces under Brigadier General Kenner Garrard moved into town. Orders from his commander, General Sherman, were to burn bridges over the Yellow and Alcovy Rivers and destroy the railroad between nearby Lithonia and the Alcovy. Successfully completed, this raid stopped all communication between Augusta and Atlanta. Fortunately, many plantations and town homes were spared by Sherman on his "March of the Sea." In 1988, Covington was awarded the designation of a Georgia "Main Street" city due to the community's dedication to the preservation of its 19th century structures. Adorning the Main Street area and National Register Districts are carefully restored antebellum and Victorian-era homes, churches, parks, and the Downtown Square. Still the center of the community, the Square is often host to festive social events such as outdoor luncheon concerts. Covington has been a popular on-site shooting location for many feature films and one of the longest-running television series, "In the Heat of the Night." This series starred and was directed by Carroll O'Connor. Souvenirs of the series are available from the In the Heat of the Night Souvenir Shop located in the Covington Flower Shop on the Square in Covington. Main trades for the area are textiles, concrete pipes & lumber mills. 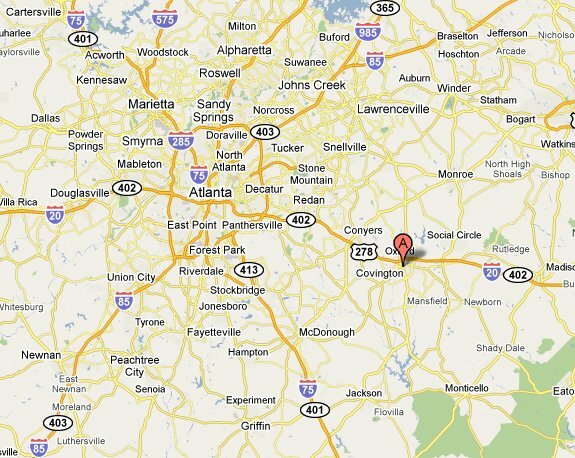 A point of interest for Covington researchers is that 2 miles east of Covington, lies the small town of Covington Mills. The population in 1940 stood at 317. Estimated in JUne 2006 as 14,272. Businesses in Covington which appear in the U.S. Million Dollar Directory of 1988 are The Bank Of Covington, Newton Federal Savings & Loan Association and Twin Hills Farm. Georgia Historic Society, 501 Whitaker St., Savannah 31401 and The Atlanta Historic Society Library, 1753 Peachtree St., N.E. Atlanta 30309 may be worth contacting for further information. Newton County and the City of Covington once belonged to the Creek Indian Nation. The Creek Indians roamed the land as the first English settlers landed on the coast of Georgia in 1733. In 1813 Georgia Governor Thorp negotiated a treaty whereby the Creek Indians relinquished all claim to the land.. Named in honor of Sergeant John Newton, a Revolutionary Soldier, Newton County was formed by the Georgia General Assembly on December 24, 1821. The first settlers (primarily from the Carolinas and Virginia) began arriving during this era, selecting the Eastern part of the county around a town called Winton for their homesteads. Winton was the site of the first brick building in the county. The Brick Store served as a general store, a stage coach stop and was the location of the first session of Newton County Court in April of 1822. The Georgia General Assembly, however, insisted with very few exceptions that the county seat be in the center of the community, so Newton County's seat was moved west to "Newtonborough:. Renamed for General Leonard Covington of the American Revolution, the Indian War and the War of 1812. Covington was incorporated on December 6, 1822. The completion of the railroad in 1845 brought new growth and direction to the area. Until the early 1900's, Covington and Newton County was strictly agricultural. Crops grown in the county included barley, corn, cowpeas, grain sorghum, hay, oats, peaches, pecans, peanuts, rye, soybeans, sweet potatoes, watermelons and wheat. However, like most Georgia counties, "Cotton was King" and the development of the cotton mill brought the first sign of real prosperity to Covington. The town continued to grow as a business and agricultural center and was soon accepted as the cotton market for local farmers. The sawmill and pulpwood industry also contributed to the growing economy of Newton County. Civil War Covington and Newton County played an active role in the Civil War. The evening of July 20, 1864, saw Union forces under Brigadier General Kenner Garrard move into Covington. Orders from his commander, General Sherman, were to burn bridges over the Yellow and Alcovy Rivers and destroy the railroad between Lithonia and the Alcovy. Successfully completed, this raid stopped all communication between Augusta and Atlanta and ended all hope that defenders of Atlanta might receive desperately needed reinforcements from the Eastern Confederacy. Fortunately, many plantations and town homes were spared by Sherman on his "March to the Sea". Today' these historical homes and landmarks remain a proud reminder of our country's heritage. The above information was compiled by Mrs. Irene Robinson Smith and the late Mrs. Sara Clay Patterson. Both served as presidents of the Newton County Historical Society and The Covington Garden Club.